NETWORK FINALS: EMPIRE and THE GOLDBERGS gained 0.1 in final numbers, but BLACK-ISH and NASHVILLE fell the same. CABLE HIGHLIGHTS: It was all sports at the top of Wednesday cable. TNT’s NBA PLAYOFFS were dominant, with the clinching Golden State vs. Portland game at 2.58, and Miami vs. Toronto at 1.60. NBC Sports Net’s NHL PLAYOFFS game was far behind, but still solid at 0.50. MTV’s THE CHALLENGE gained 0.05 to 0.43, with lead-in CATFISH down 0.03 to 0.38. On Bravo, REAL HOUSEWIVES OF NYC declined 0.04 to 0.42, and THERE GOES THE MOTHERHOOD slipped a hundredth to 0.14. 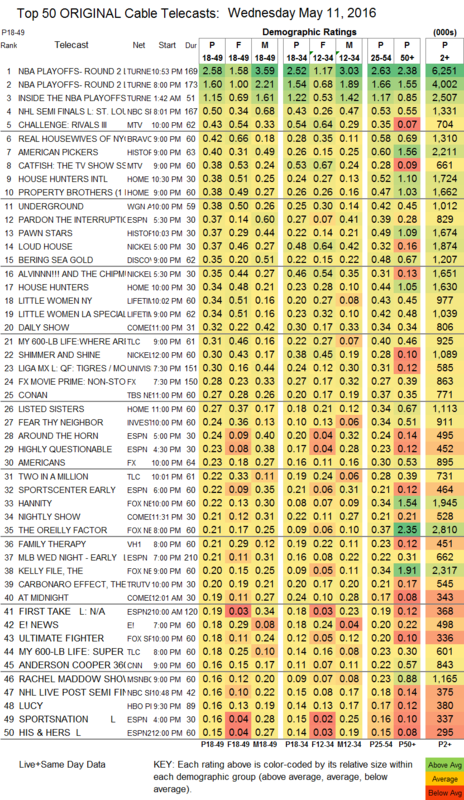 History’s AMERICAN PICKERS rose 0.03 to 0.40, and PAWN STARS was down 0.02 to 0.37. On HGTV, HOUSE HUNTERS INTL and PROPERTY BROTHERS were both at 0.38, which was up 0.05 for the former, . The season finale of WGN’s UNDERGROUND gained 0.05 to 0.38. Discovery’s BERING SEA GOLD ticked down to 0.35. On Lifetime, LITTLE WOMEN NY was down 0.09 to 0.34, and a LITTLE WOMEN LA special was also at 0.34. On TLC, MY 600-LB LIFE held at 0.31, and TWO IN A MILLION was down a tick to 0.22. FX’s THE AMERICANS fell 0.07 to 0.23. VH1’s FAMILY THERAPY dropped 0.06 to 0.21. Tru’s THE CARBONARO EFFECT ticked up to 0.20. 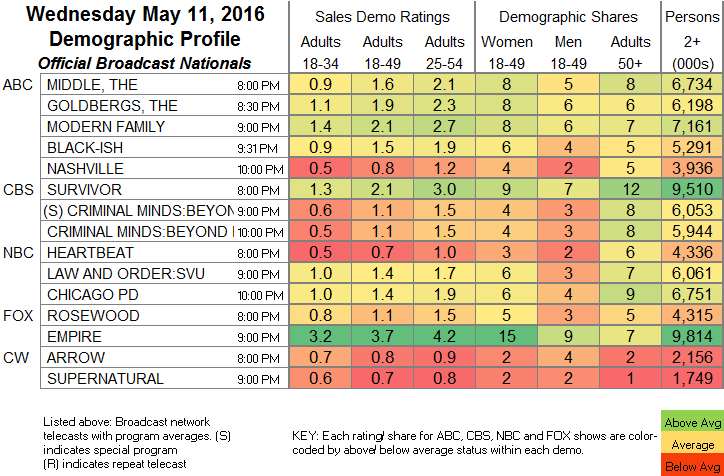 On TV Land, LOPEZ fell 0.03 to 0.10, and THE SOUL MAN was also down 0.03 to 0.07. POP’s SCHITT’S CREEK gained 0.03 to 0.08. El Rey’s LUCHA UNDERGROUND slipped 0.01 to 0.02/96K in its first hour and held at 0.02/81K in the 2d. IFC’s MARON was steady at 0.04/111K. Sundance’s THE LAST PANTHERS stayed at 0.01/38K.